Love the music of the 1930s and 40s? Swing Guitar Essentials takes a closer look at the acoustic jazz sounds of Django Reinhardts Gypsy jazz, the western swing of Eldon Shamblin and Charlie Christians proto-bebop work with Benny Goodmans great band of the late 30s. Swing Guitar Essentials offers both overview of the various styles within the genre plus a nuts-and-bolts approach to playing vintage acoustic jazz. Well look at chords and chord progressions, getting the right rhythmic feel, improvisation, building a repertoire and learning how to play with other musicians, while keeping things simple, understandable, clear (and fun)! This course is perfect for the self-taught intermediate guitarist. You do not need to know how to read or write music, nor have a background in music theory or jazz. Pete moved to Oregon from his California home town in 1984 to attend Oregon State University, and has been a member of the Portland, Oregon musical community since 1988. His bands have included Hazel, Golden Delicious, The Stolen Sweets, The Portland Playboys and Thee Catnip Brothers, exploring genres as diverse as punk rock, gypsy jazz and traditional country. His discography contains dozens of releases on a variety of labels including Cavity Search, Rough Trade and Sub Pop. He has toured extensively both domestically and abroad, sharing the stage with a diverse mix of musicians including Nirvana, Elliott Smith, Dead Moon, Peter Rowan, Patrick Saussois, the Hot Club of Cowtown, Sleater-Kinney and hundreds of others. He has performed at Lollapalooza, the Portland Jazz Festival, CMJ, Pickathon, Bumpershoot, and SXSW, and at venues large and small including Preservation Hall, CBGB’s, the Troubadour and the Knitting Factory. His work has been featured in Spin, Pitchfork, No Depression and MTV, and he has contributed original material for the Oregon Cultural Trust. 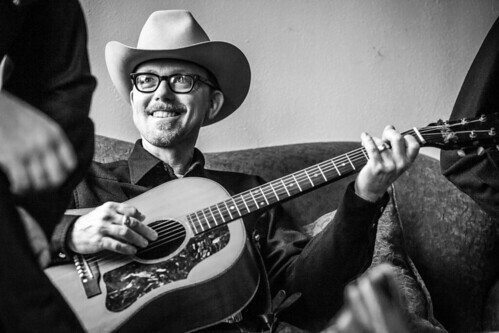 He is a two-time inductee into the Oregon Music Hall of Fame, and a double cancer survivor. An in-demand performer, teacher and session musician, he lives in the NE Portland Cully neighborhood with his dog, Dixie.